Berton Jenkins "Higgie/Jinks" Higgins was born March 22, 1887, in Fairfield Twp., Sauk Co., WI, and died December 23, 1978, at Jefferson Meadows Nursing Home, Baraboo, Sauk Co., WI, at age 91. Buried in Walnut Hill Cemetery, Baraboo, Sauk Co., WI. He is the son of Berton Higgins of McHenry Co., IL, and Harriet Jane "Hattie" Harmon of Greenfield, Sauk Co., WI. Clarissa Belle "Claire" Abbey was born August 14, 1887, in Fond du Lac Co., WI, and died October 24, 1966, at St. Joseph's Hospital, Marshfield, Wood Co., WI, at age 79. Buried in Walnut Hill Cemetery, Baraboo, Sauk Co., WI. She is the daughter of Charles Washington Abbey of South Byron, Fond du Lac Co., WI, and Cora Adella Armstrong of Baraboo, Sauk Co., WI. Berton Jenkins "Higgie" Higgins, (age 24), a bachelor, and Clarissa Belle "Claire (Abbey) Higgins (age 24), a maiden, were married August 9, 1911, at the home of Mr. and Mrs. Lucius Bump, Mound Street, Baraboo, Sauk Co., WI. Both are buried in Walnut Hill Cemetery, Baraboo, Sauk Co., WI. 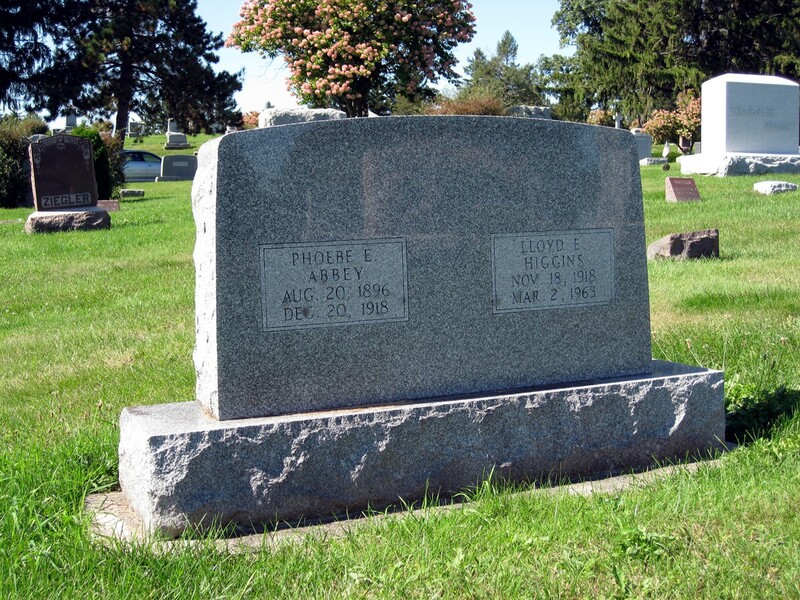 Also buried there are their two children and Clarissa's sister, Phoebe E. Abbey, as well as other Higgins family members. Evelyn Arlene Higgins: Born November 22, 1915, in Baraboo, Sauk Co., WI; Died May 16, 1916, in Baraboo, Sauk Co., WI (about age 5 months). Buried in Walnut Hill Cemetery (Baraboo Cemetery), Baraboo, Sauk Co., WI. Lloyd Eugene Higgins: Born October 18, 1918, in Baraboo, Sauk Co., WI; Died March 2, 1963, in a two-car accident seven miles west of Green Bay, Brown Co., WI (age 44). Buried in Walnut Hill Cemetery (Baraboo Cemetery), Baraboo, Sauk Co., WI. Married June 25, 1943, in Phenix City, Russell Co., AL, to Roberta Lee Robinson: Born April 26, 1927, in Valley Co., MT. Divorced. 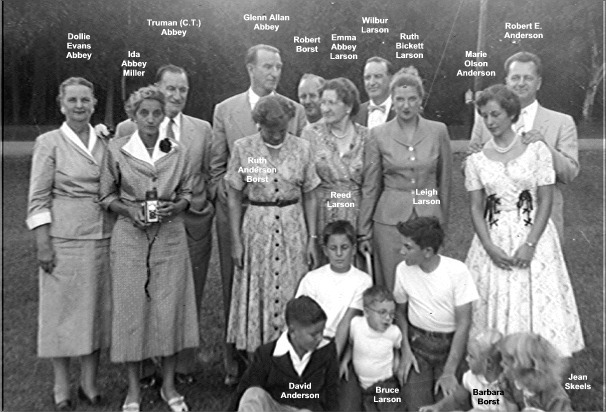 Roberta is the daughter of Leslie Mather Robinson of Atlanta, Phelps Co., NE, and Lilith Corrine "Lila" McDonald of Watertown Codington Co., SD. Leslie and Lilith were married September 8, 1924, in Glasgow, Valley Co., MT. Leslie lived to age 100. Leslie filed for divorced July 18, 1935, in Billings, MT, on grounds of desertion in September, 1931. Divorce granted about September 9, 1935, in Billings, MT. Leslie then married Martha Arline Joyner on September 5, 1941, in Henderson Co., KY. Roberta then married Albert E. Tetlock. Lilith then married Benjamin Franklin Sutton. 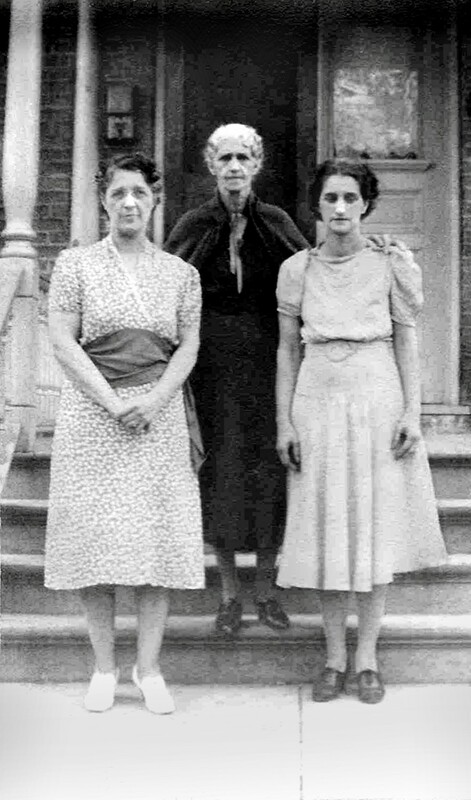 In 1935, Lilith and her husband Benjamin Sutton, were living in Belleville, Yell Co., AR, and in 1940 in Minneapolis, MN. Leigh Larson visited Walnut Hill Cemetery on September 17, 2008. Both sides of the same gravestone are shown. Berton Jenkins "Higgie" Higgins was born March 22, 1887, in Fairfield Twp., Sauk Co., WI. Clarissa Belle "Claire" Abbey was born August 14, 1887, in Fond du Lac Co., WI. The 1895 Wisconsin State Census taken on June 20, 1895, shows Burton Higgins is Head of Household living in Fairfield Twp, Sauk Co., WI. There are a total of 5 Males and 5 Females living there, all born in the United States. The 1900 U. S. Census taken on June 6, 1900, shows C. W. Abbey (age 38) born August 1861 in Wisconsin to English Canadian and English-born parents is a Laborer renting his home and is living in Milladore Twp., Wood Co., WI. 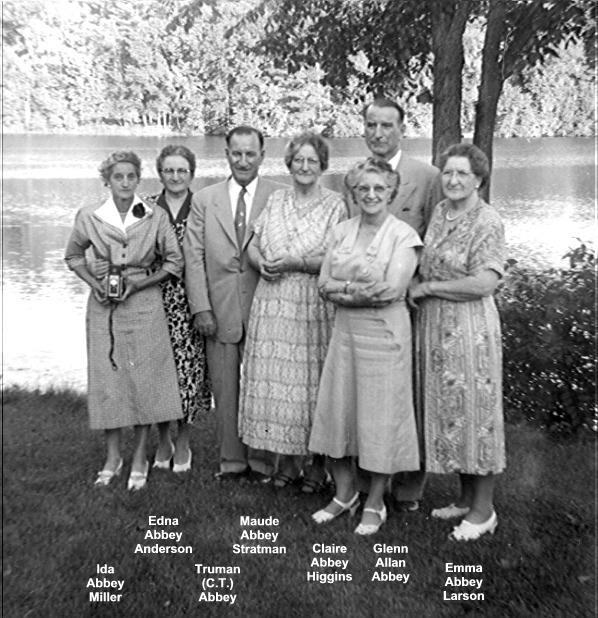 Living with him is his wife of 17 years, Cora Abbey (age 33) born September 1866 in Wisconsin to English Canadian and New York-born parents, with all six of the children born to her still alive. 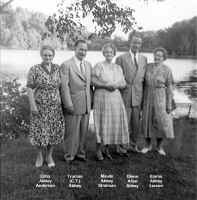 Also living there are his five children, all born in Wisconsin to Wisconsin-born parents: Maud Abbey (age 14) born June 1885; Samual Abbey (age 7) born August 1892; Phebe Abbey (age 5) born August 1894; Ida Abbey (age 3) born January 1897; and Orin Abbey (age 9/12) born October 1899. The 1900 U. S. Census taken on June 5, 1900, shows James P. Barber (age 41) born June 1858 in Wisconsin to Ohio and English Canadian-born parents is a Farmer owning his farm with a mortgage and is living in Eau Pleine Twp., Portage Co., WI. 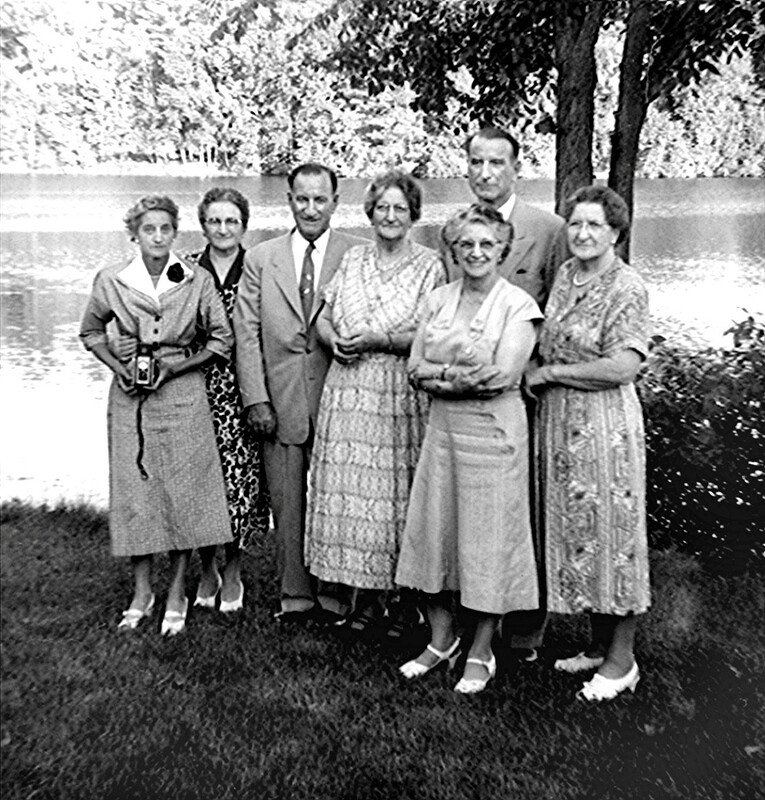 Living with him is his wife of 14 years, Mathilda Barber (age 31) born August 1868 in Wisconsin to German-born parents, with one of the two children born to her still alive. Also living is his son, Evin Barber (age 12) born February 1888 in Wisconsin to Wisconsin-born parents. Also living there: a Boarder, John Norton (age 56) born August 1843 in New York to English Canadian-born parents, an unmarried Day Laborer; and a Servant, Clara Abba (age 12) born in Wisconsin to Wisconsin-born parents, a House Keeper. The 1905 Wisconsin State Census taken on June 1, 1905, shows Hattie Higgins (age 43) born in Wisconsin to Pennsylvania-born parents is a widow renting her farm and is living in Fairfield Twp, Sauk Co., WI. Living with her are her 8 unmarried children, all born in Wisconsin to Illinois and Pennsylvania-born parents: Myrtle Higgins (age 21) a Student; Charles T. Higgins (age 19) a Farm Hand; Burton J. Higgins (age 18) a Farm Hand; George Higgins (age 17) a Farm Hand; Irene Higgins (age 15); Roy Higgins (age 13); Ethel Higgins (age 6); and Carl Higgins (age 8/12). In 1906 Charles removed to Beulah, ND, and farmed south of the city. He was one of the pioneer settlers of Beulah. The 1910 U. S. Census taken on May 4, 1910, shows Charles Abbey (age 48) born in Wisconsin to English-born parents is a Farmer owning his farm free of a mortgage and is living in Twp. 142, Mercer Co., ND. Living with him is his wife of 26 years, Cora Abbey (age 42) born in Wisconsin to New York and Canadian-born parents, with all six of the children born to her still alive. Also there are his five unmarried children, all born in Wisconsin to Wisconsin-born parents: Clara Belle Abbey (age 22), who works in a Woolen Factory; Samuel Abbey (age 17), a Farm Laborer on the Home Farm; Phoebe Abbey (age 15); Ida Abbey (age 12); and Oran Abbey (age 10). 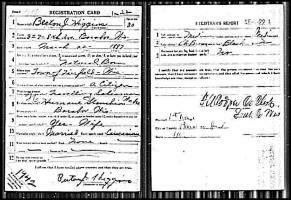 Leigh Larson note: His daughter, Hellen Maude, was crossed off the census entry, since she had moved away and married H. Oriel Sovereign. Clara B. Abbey (age 22) is a duplicate entry shown living in Baraboo, Sauk Co., WI, on April 20, 1910, as a Lodger in the Charles Burdick household. She is a Drawer in a Woolen Mill. Berton Jenkins "Higgie" Higgins, a bachelor, and Clarissa Belle "Claire" Abbey, a maiden, were married August 9, 1911, at the home of Mr. and Mrs. Lucius Bump, Mound Street, Baraboo, Sauk Co., WI. Miss Clara Abbey and Berton J. Higgins United. Last evening at the home of Mr. and Mrs. Lucius Bump, Mound street, the wedding of Miss Clara Abbey to Berton J. Higgins took place. Rev. C. S. Knight officiated and the couple were attended by Corey Norton, Miss Hazel Gerofski, Roy Higgins and Miss Pearl Goude. About twenty of the nearest relatives and friends were present. After the ceremony an elaborate repast was served. Mr. and Mrs. Higgins left on passenger train No. 11 last night for Superior, Duluth and various points in North Dakota. They will make their home in North Dakota where the bride's parents now reside. The bride has been making her home with Mr. and Mrs. George Holmes, Third avenue, and the groom is a son of Mrs. Bert Higgins of Fairfield. At the station last night they were met by a crowd of young friends and showered with rice. Evelyn Arlene Higgins died May 16, 1916, in Baraboo, Sauk Co., WI, at age 5 months. Buried in Walnut Hill Cemetery (Baraboo Cemetery), Baraboo, Sauk Co., WI. 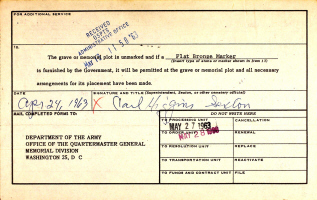 The WWI Draft Registration Report dated 1917 or 1918 shows Berton J. Higgins is a married Traveling Salesman for Humane Stanchion Works and is living at 327 8th Avenue, Baraboo, Sauk Co., WI. The 1920 U. S. Census taken on January 9, 1920, shows Berton J. Higgins (age 32) born in Wisconsin to Illinois and Wisconsin-born parents is a Barn Equipment Traveling Salesman renting his home and is living at 327 8th Avenue, 1st Ward, City of Baraboo, Baraboo Twp., Sauk Co., WI. Living with him is his wife, Clarissa Higgins (age 31) born in Wisconsin to Wisconsin-born parents. Also living there is his son, Lloyd Higgins (age 1-2/12) born in Wisconsin to Wisconsin-born parents. Also living there is Berton's unmarried brother-in-law: Oran Abbey (age 20) born in Wisconsin to Wisconsin-born parents. 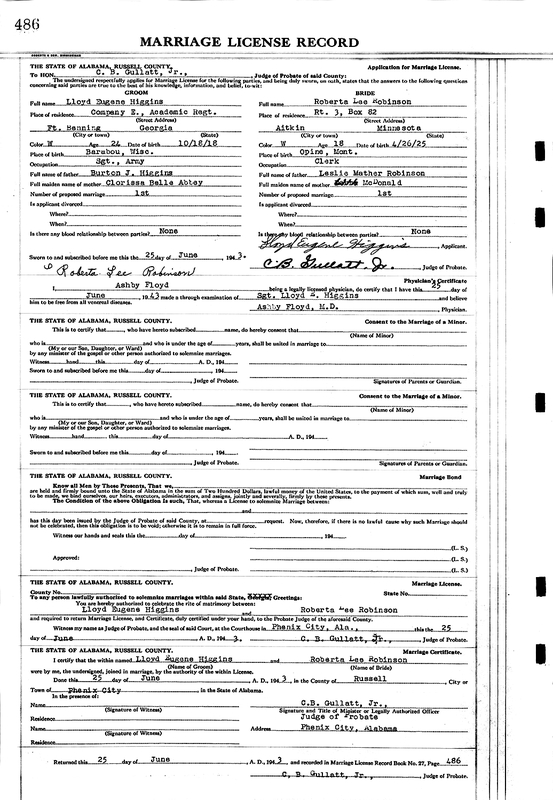 The 1930 U. S. Census taken on April 11, 1930, shows Burtin Higgins (age 42) born in Wisconsin to United States-born parents and first married at age 24 is a Barn Equipment Contractor owning his home worth $3,500 and is living at 821 Summit Street, 1st Ward, City of Baraboo, Sauk Co., WI. Living with him is his wife, Clarissa Higgins (age 41) born in Wisconsin to Wisconsin-born parents and first married at age 23. Also living there is his son: Lloyd Higgins (age 11), born in Wisconsin to Wisconsin-born parents. The 1940 U. S. Census taken on April 22, 1940, shows Burton Higgins (age 53) born in Wisconsin, and 5 years ago was living in the Same House, and with 1 year of High School, is a Salesman of Barn Equipment, and who owns his home worth $3,360 and is living at 821 Summit Street, 1st Ward, Baraboo, Sauk Co., WI. Living with him is his wife, Clarissa Higgins (age 50) born in Wisconsin, and 5 years ago was living in the Same House, and with 2 years of High School. Also living there is his son, Lloyd Higgins (age 21) born in Wisconsin, and 5 years ago was living in the Same House, and with 4 years of High School, a Surveyor Helper for the State Highway. Also living there is an unmarried Roomer, John T. Garner (age 32) born in Wisconsin, and 5 years ago was living in Bloomington, Grant Co., WI, and with 2 years of College, a Farm R. R. Supervisor for the Dept. of Agriculture. Lloyd E. Higgins enlisted October 15, 1940, at Baraboo, Sauk Co., WI in the National Guard, US Army, Infantry. He had 3 years of High School. Lloyd Eugene Higgins and Roberta Lee Robinson were married June 25, 1943, in Phenix City, Russell Co., AL. 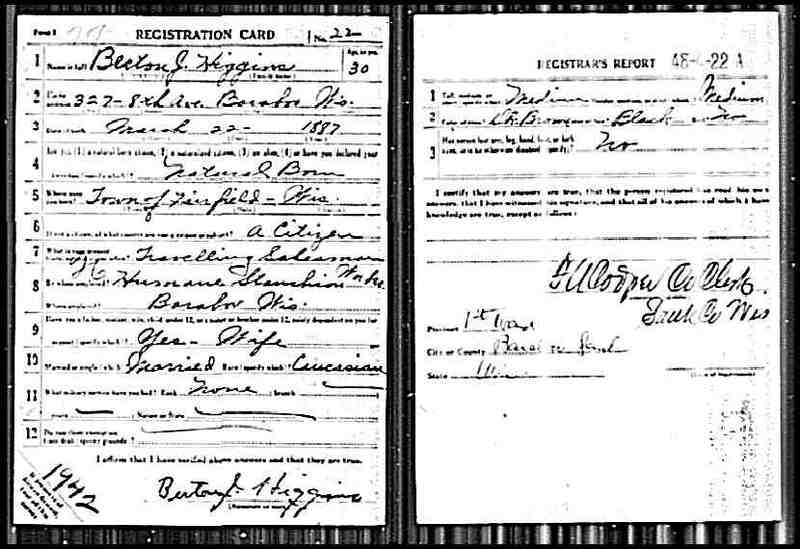 Lloyd Eugene Higgins and Roberta Lee Robinson marriage record. Sgt. Lloyd Higgins, who had been instructing at Fort Benning, Ga., before being hospitalized these last four months at Billings General Hospital, Fort Benjamin Harrison, Ind., is visiting this week, while on furlough, with his parents, Mr. and Mrs. B. J. Higgins, 501 S. Maple street. They met him in Baraboo Sunday and accompanied him home from there. Sgt. Higgins will leave this week end for Camp Shelby, Miss., where he has been assigned. Visiting at the home of Mr. and Mrs. B. J. Higgins, 608 S. Ash street, are Mr. and Mrs. Ira Miller and two sons, Richard and Ira E. from Lake Ariel, PA.
Clarissa Belle "Claire" (Abbey) Higgins, Cora Adella (Armstrong) Abbey and Ida Delilah (Abbey) Miller, about 1949. Photo courtesy of Kay Koslan. Guests on Saturday at the home of Mr. and Mrs. B. J. Higgins, S. Ash street, were the latter's nephew and niece, Sgt. and Mrs. David Miller and daughter, Albuquerque, N. M. They have also been visiting at the home of his parents, Mr. and Mrs. Ira E. Miller, Granton. At the expiration of his furlough, Sgt. Miller will report for duty in California en route to Japan. Mrs. Helen M. Sovereign, who has been a house guest of her brother-in-law and sister, Mr. and Mrs. B. J. Higgins, S. Ash Ave., left last night to continue her visit with relatives in Minneapolis; her son in Boise, Idaho, and friends in Portland, Ore., before returning to her home in Los Angeles sometime in September. It was the first time in 30 years that Mrs. Higgins had seen her sister. While in this area she visited another sister, Mrs. Ira Miller at Granton. Prior to coming to Marshfield, Mrs. Sovereign visited several weeks with relatives and friends in Albuquerque, N. M., Omaha, Neb., and points in Illinois. Mr. and Mrs. B. J. Higgins, 608 S. Ash Ave., will be Christmas Day guests of the latter's brother-in-law and sister, Mr. and Mrs. Ira Miller, and family at Granton. 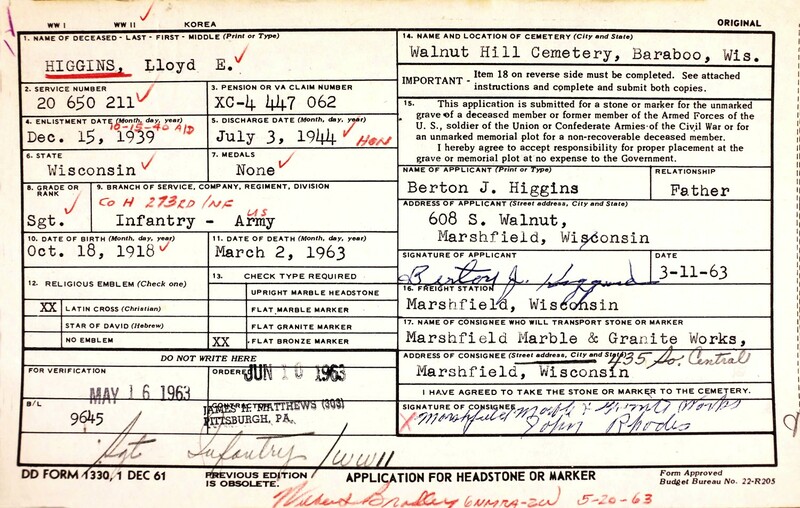 Lloyd Eugene Higgins died March 2, 1963, in a 2-car accident seven miles west of Green Bay, Brown Co., WI, at age 44. Buried in Walnut Hill Cemetery (Baraboo Cemetery), Baraboo, Sauk Co., WI. The toll of the bloody weekend on Wisconsin highways included Lloyd E. Higgins, 44, 608 S. Ash Ave., who died in a Brown County accident Saturday afternoon which snuffed out the lives of all four persons involved. They died in a head-on crash of two autos at the intersection of Highways 29 and 32, and a town road, 7 miles west of Green Bay, at 4:14 p. m. Higgins was alone in his car. Victims in the other vehicle were all members of a rural Oneida family - Eastman Skenadore, 53; his wife, Lucille, 49, and a son, Gordon, 7. Authorities said all four died instantly. They theorized the Skenadore car might have been making a left turn onto the town road when the crash occurred, since the family home was in that direction. Skenadore's car was driven backward about 200 feet from the point of impact. There is a small rise at the point of the crash which the Marshfield man's vehicle climbed before reaching the intersection. The Skenadore had two other children, whom authorities reported had been left in the care of an aunt for the day. Funeral services for Lloyd E. Higgins will be held at the Hansen Funeral Home here at 10 a. m. Tuesday, with the Rev. Douglas P. Oyan, pastor of the First Presbyterian Church, officiating. Interment will be made in the Walnut Hill cemetery in Baraboo. Higgins was born Oct. 18, 1918, in Baraboo and graduated from the Baraboo High School in 1938. He entered the armed forces in 1940, serving about four years, after which he was employed at Badger Ordinance Works. He later moved to Wisconsin Rapids, where he worked for five years. Since coming to Marshfield, he had been employed by the Mutual of Omaha Insurance Company as a claims adjuster. Higgins was a member of the United Commercial Travelers. 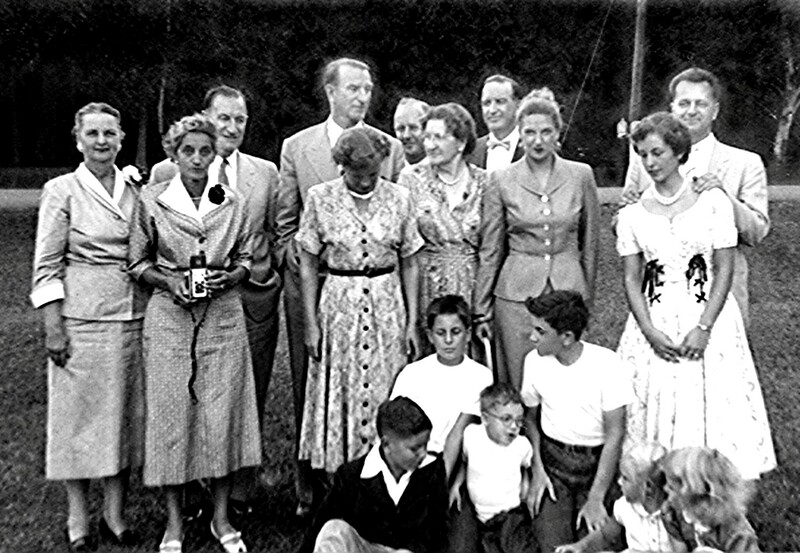 Survivors include his parents, Mr. and Mrs. B. J. Higgins of Marshfield. A sister died in infancy. The Past Presidents Parley of the American Legion Auxiliary will meet at the funeral home this evening at 7:30 o'clock, to pay their respects. Lloyd E. Higgins, 44, Marshfield, a former Wisconsin Rapids resident, died in a Brown County accident Saturday afternoon which snuffed out the lives of all four persons involved. They died in a head-on crash of two autos at the intersection of Highways 29-32 and a town road, seven miles west of Green Bay, at 4:15 p.m. Higgins was alone in his car. Victims in the other vehicle were all members of a rural Oneida family - Eastman Skenadore, 53, his wife, Lucille, 49, and a son, Gordon, 7. Funeral Tuesday. Funeral services for Higgins will be held at the Hansen Funeral Home in Marshfield at 10 a.m. Tuesday, the Rev. Douglas P. Oyan officiating. Interment will be in the Walnut Hill Cemetery at Baraboo. 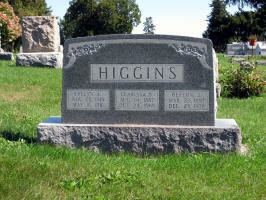 Higgins was born at Baraboo Oct. 18, 1918, and graduated from high school there in 1938. He entered the armed forces in 1940, serving four years, after which he was employed at Badger Ordinance Works. He moved to Wisconsin Rapids in 1949, working at the Montgomery Ward Store. Since moving to Marshfield in 1956, he had been employed as an insurance claims adjuster. 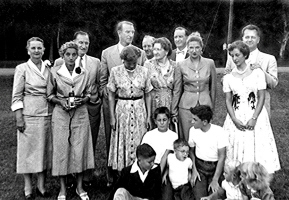 Survivors include his parents, Mr. and Mrs. B. J. Higgins of Marshfield. 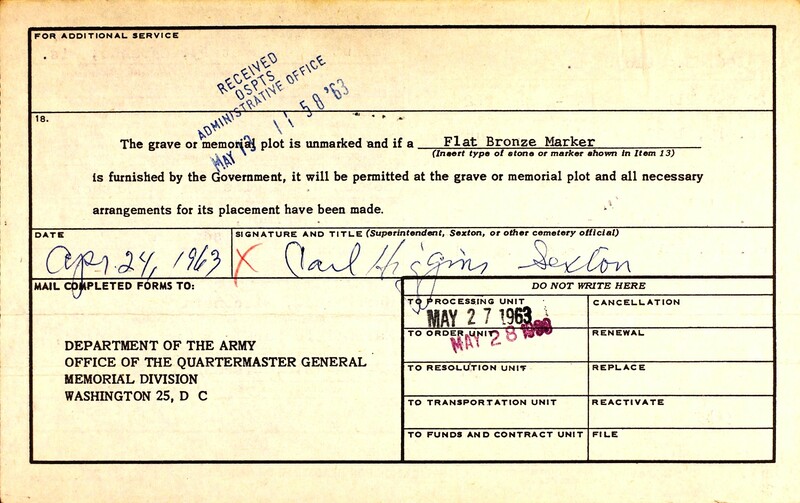 The Military Gravestone Request for Lloyd Eugene Higgins. Clarissa Belle "Claire" (Abbey) Higgins died October 24, 1966, at St. Joseph's Hospital, Marshfield, Wood Co., WI, at age 79. Buried in Walnut Hill Cemetery, Baraboo, Sauk Co., WI. Mrs. B. J. Higgins, 79, of 608 S. Ash Ave., died at 2:45 p.m. Monday in St. Joseph's Hospital following a lingering illness. Services will be conducted at 1 p. m. Wednesday at the Hansen Chapel here with the Rev. Virgil E. Taylor, pastor of the First Presbyterian Church, officiating. Burial will be made in the Walnut Hill cemetery at Baraboo. The body will repose at the funeral home from 2 p.m. today until the time of services. The former Clarissa Abbey was born in Fond du Lac County on Aug. 14, 1887, and at an early age moved to Milladore and then to Baraboo where she received her education. Her marriage to Berton J. Higgins took place Aug. 9, 1911, at Baraboo. After their marriage, the couple made their home in Baraboo until March 15, 1941, when they came to Marshfield. Mrs. Higgins was a member of the Circles of the First Presbyterian Church, past president of the American Legion Auxiliary, and was active in the Grey Ladies, Home Nursing and the Royal Neighbors. In addition to her husband, survivors are two sisters, Mrs. Ira (Ida) Miller, Bonduel; and Mrs. Helen M. Sovereign, Los Angeles, Calif. She was preceded in death by a son, Loyd on March 2, 1963; a daughter, in infancy; two brothers and a sister. Services were conducted on Wednesday afternoon at the Hansen Chapel for Mrs. B. J. Higgins, who died Monday. The Rev. Virgil E. Taylor, pastor of the First Presbyterian Church, officiated, and burial was made in the Walnut Hill cemetery at Baraboo. Pallbearers were John Carpenter, Dr. Fred Farley, Al Kohs, Ronald Hupe, Glenn D. Tinkham and Louis David. Mrs. John F. Lueck, accompanied at the organ by Mrs. Glenn D. Tinkham, sang "The Lord's Prayer." Attending the services were Mr. and Mrs. Ira Miller, Bonduel; Carl Higgins, George Higgins, Gary Higgins, Ralph Higgins, Mr. and Mrs. Wendal Higgins, Charles Hackett, Mr. and Mrs. Glen Allen, Mrs. Clarence Zuehlke, Mrs. Everett Davis, Mrs. Jesse Von Wald, Walter Schacht, Dr. and Mrs. F. E. Wood and Mr. and Mrs. Donald E. Frisch, Baraboo; Mr. and Mrs. Glen Harman and Mr. and Mrs. Albert Tritz, Portage; Mr. and Mrs. Herman Galston, Black River Falls; Mr. and Mrs. Ed Finnegan and Charles Higgins, Reedsburg, and many other relatives and friends from Baraboo, Marshfield and the surrounding areas. Berton Jenkins Higgins died December 23, 1978, at Jefferson Meadows Nursing Home, Baraboo, Sauk Co., WI, at age 91. Buried in Walnut Hill Cemetery, Baraboo, Sauk Co., WI. Mr. Berton J. Higgins, age 91, of Baraboo died early Saturday morning, December 23 at Jefferson Meadows after a long illness. He moved to Marshfield in 1941 where he was employed as a salesman for Berg Farm Equipment Company for 15 years. He was a member of the Presbyterian Church of Marshfield. 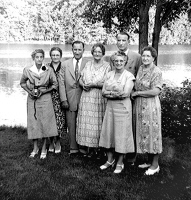 Survivors include one brother, Carl of Baraboo; one sister, Ethel Steele of Riverside, California and other relatives and friends. He was preceded in death by one daughter; one son; four brothers and three sisters. Funeral services were held today at 2 p. m. Pastor Ronald Larsen officiated. 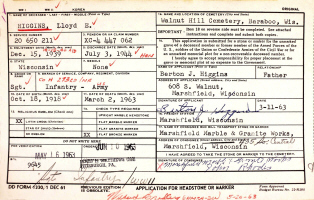 Burial was made in Walnut Hill Cemetery in Baraboo. Word has been received of the death of a former Marshfield resident. Berton J. Higgins died early Saturday at Jefferson Meadows Nursing Home, Baraboo. Death followed a lengthy illness. He was 91. The funeral was Tuesday in Baraboo. Burial was in Walnut Hill Cemetery, Baraboo. Mr. Higgins came to Marshfield in 1941 and worked for Berg Farm Equipment Company for 15 years. While in Marshfield he was a member of the First Presbyterian Church. He is survived by a brother, Carl of Baraboo; and a sister, Mrs. Ethel Steele of Riverside, Calif.